Just so you know, this isn’t a review. It’s just a discussion on what I did to make some old hardware useful again. I’ve made mention from time to time the Toshiba Satellite A75 that I have that has been a backup machine for me for years now. Well, with my 3+ year old System76 laptop on its last legs and suddenly developing a short in its screen connection, I decided to blow the dust off that trusty old Toshiba again and use it as a stopgap until I get something newer. The problem is, this Toshiba Satellite is from 2005, has a single core 32-bit Pentium 4 processor, 1.5 GB of RAM, and a 60 GB hard drive. Needless to say, it’s a bit out of place in today’s world, so I had to put some thought into how to best optimize this machine’s return to productivity or it’d be pretty painful to use. It’s funny, but we get so used to the mindset that Linux is lightweight (at least lighter weight than the stuff from Microsoft) and good on old hardware that we forget sometimes that it’s come a long way over the years and the full-featured desktop OSes that top the list these days on Distrowatch aren’t the slim, speedy racecars that will run on literally anything like we used to see years ago. Since January, I’ve been running Linux Mint Debian Edition (LMDE) as my primary OS of choice, and it was already installed on my 8 year old Toshiba Satellite, because I had used it for testing back then. The thing is, LMDE — while noticeably faster than the Mint “standard” editions — is still a full-featured desktop OS. It’s heavy by comparison to the stuff I used to run on this old laptop. I mean, the last time this laptop was my main machine, I was running Linux Mint 8 Fluxbox Community Edition on it, and that used to run just fine. Sure, I also ran the first two releases of Peppermint on it, and had great luck, but it really wasn’t my primary machine anymore by then (I was using it for testing what was supposed to be a lightweight and fast hybrid OS, so that I could write reviews). In the intervening years, I’ve grown accustomed to driving a Cadillac of Linux operating systems — Linux Mint — rather than a souped up, stripped-down-for-performance stock car. After pondering my options, I had narrowed them down to Fluxbox for my window manager (because it’s still my favorite, and in order to find anything faster, you start having to delve into less conventional, tiling window managers like xmonad and the hilariously named Ratpoison), and a tossup between Peppermint Four and Crunchbang 11 for the underlying OS. Some of you may have noticed my Google+ post on the subject yesterday, which I made to help sort out the pros and cons. Yes, I know, there are other distros that might also have been good contenders, and if I didn’t entertain your suggestions there yesterday, it wasn’t out of any disrespect, it’s just that I’d already narrowed my list down to those two, so it was time for me to focus on those options. Peppermint had some good things in its “pro” list. I’ve used it extensively before, and I knew that it was developed with speed and simplicity in mind, and because I’d had good experiences with it in the past, I knew that I could expect quality in its implementation, even though I hadn’t used Peppermint since Peppermint Two. So it was a known to me, and that goes a long way towards not having to fiddle around with unfamiliar stuff just to get things working the way I like them — far fewer “WTF?? ?” moments when you stick to a distro that you’ve used before. Crunchbang, on the other hand, has been intriguing to me for a while, and since I’m a fan of Debian based distros these days, it seems like one I should give a try. It is reputedly very minimalist, using Openbox for its window manager (which I also like, even though I was planning on using Fluxbox), and lightweight, and stable. One thing that keeps coming up whenever I read anything about Crunchbang is the word “fast”, so this seemed like an opportunity for me to give a new distro a spin while making my old Toshiba productive again. Unable to decide based on secondhand accounts and “on paper” comparisons, I downloaded ISOs for both, burned them to disc, and tested them live on the hardware to see how they fared. I know, running a distro from a live CD isn’t the best way to determine its relative performance, but it takes a lot less time and effort than installing one, testing it, and then installing the other. And I wasn’t particularly interested in dual-booting, so live CD testing was the way I went. Now, to start out, I had been leaning toward Crunchbang, since it had such a reputation for being lightweight and minimalist. Also, I was curious about this distro, and I haven’t done any real distro hopping in quite a while. However, after testing both Peppermint Four and Crunchbang 11 live CDs, I did a 180. Peppermint Four was pretty amazing, it was somehow marginally faster than Crunchbang 11, and I could tell right away that Crunchbang would be a bit more “fiddly” for me to get it to a state where I’d be happy with using it (which ordinarily isn’t an issue for me, but I really just needed this laptop working again, so that was a con in this particular case). So I decided to go with Peppermint Four. Now I said that Crunchbang would be more “fiddly”; that isn’t to say that I wouldn’t be fiddling around with Peppermint. On the contrary, this still involved some fiddly work. I installed Peppermint Four on a 9 GB partition on my Toshiba Satellite’s hard drive, leaving the rest for my /home partition. Installation went well, only taking about 20 minutes or so. Post-install, I logged into Peppermint’s default desktop (which is still a very nicely themed LXDE), connected to my wireless network, and then spent the next 15 minutes or so letting the system install updates. While it was doing that, I was copying my data over from my USB hard drive (which wasn’t much, but I figured that’d be quicker than making Dropbox pull down what I wanted to sync). This probably seems like a lot of stuff, but it really isn’t. Most of these were just a sudo apt-get install away, with the exception of Google Chrome and Google Music Manager (for which I had to download .deb files) and Pianobar, which I had to compile from git, since the version in the repositories is broken. Configuring Fluxbox was almost effortless, because I keep a backup of all my Fluxbox config files in Dropbox, so I had something to start with that was pretty close to how I prefer things. So, a few startup script tweaks (I had to add lines for xfce4-power-manager &, volumeicon &, and nm-applet & since I’ve been using wicd on my other laptop lately) and a few minor Fluxbox menu alterations and I was good to go. Fluxbox running on top of Peppermint 4. Yes, that’s Kramer from Seinfeld. So what? One thing I encountered right away in this case was an issue where PCManFM wasn’t showing any icons at all when I was trying to use it for file management tasks in Fluxbox. The issue here is that without LXDE running as its desktop environment, PCManFM doesn’t load an icon theme. Incidentally, if you ever run into the same problem, you can pick any icon theme that happens to be in /usr/share/icons for this purpose. One of the things I’ve always liked about Peppermint was the utilization of webapps in their own browser windows to perform some functions that would otherwise be handled by locally installed applications. For example, using GMail, launching in its own window, rather than using a mail client like Thunderbird or something. Perisonic, streaming one of my favorite artists from my home Subsonic server. 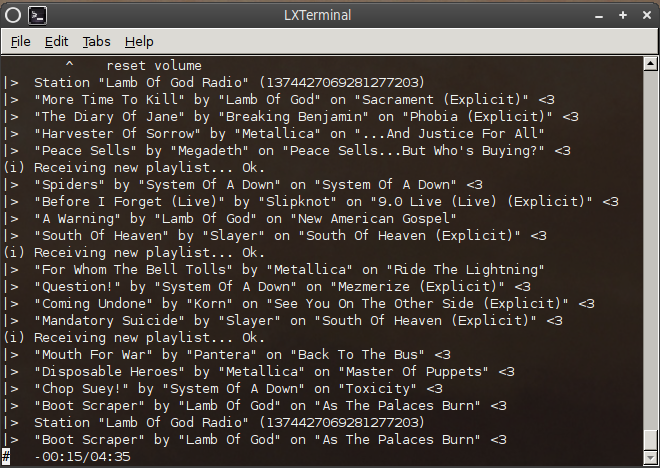 But even lighter still is the command line Pandora streaming application Pianobar, which is worth the pain to get working because it runs with very little overhead and works great once it’s set up. Being command line only, I’m not sure it fits with the level of usability they usually go for in Peppermint, but as a lightweight cloud-oriented app, it certainly isn’t out of place. Maybe they should consider Pithos in the future, since that’s a nice, lightweight, graphical Pandora client that I also like, and that might fit better with Peppermint’s motif. Pianobar. It doesn’t look like much, but it packs a serious punch. I also really like using Pixlr‘s image editor for quick-and-dirty graphics work instead of GIMP, because on this poor old laptop, GIMP runs like molasses in January. 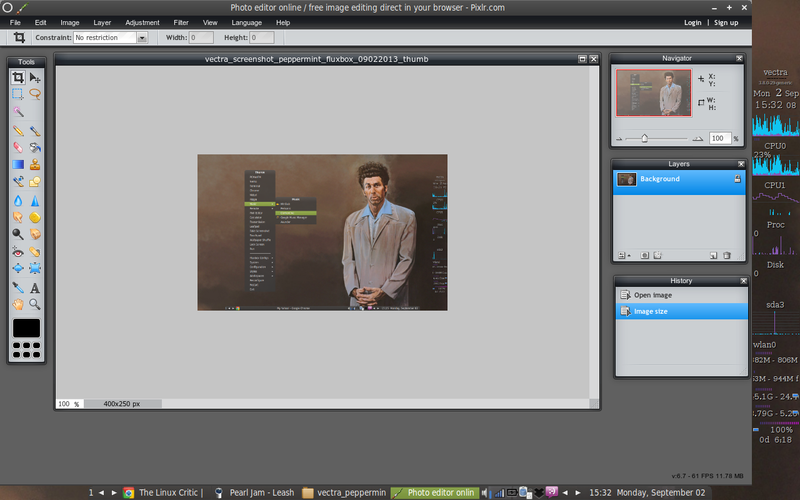 Pixlr works well for basic stuff, like resizing screenshots for Linux Critic posts. So, in that very first screenshot (the one showing my Fluxbox menu), you’ll note some menu items for some of these webapps, which are convenient, take up less space than locally installed applications, and tend to be a bit easier on other tired old resources as well. So, damn it, Peppermint team. You’ve dragged me back again, just when I thought I’d gotten away clean, too. No, this wasn’t a Peppermint Four review, even though it probably read somewhat like one in places. I am pretty happy to see that Peppermint can still impress me with its speed and flexibility, and even though I’m not using the default desktop, I was also pretty impressed with how nice that came together as well. Good job, guys! One of the other things I learned from this experience was that I definitely need to give Crunchbang a closer look once I have a more suitable platform with which to actually use it. It really reminds me of Slackware in a lot of ways, so I have to say, my curiosity is definitely piqued from my brief live CD testing of it. So, for the next couple of months at least, I’ll be using my old Toshiba laptop, running Fluxbox on top of Peppermint. While it’s still a sluggish old beast, it’s definitely faster under this arrangement than it had been under anything else I’ve run on it in a while, so it’s tolerable. I’m pretty much just using it like a netbook anyway… the most processor intensive application I run is Chrome. And what will I be doing to replace this? Once the new Chromebooks come out (which seems to be around November, from what I’ve been reading) I’m planning on buying one of the mid-range ones. At that point I’ll be returning this old Toshiba Satellite to its quiet retirement on a shelf downstairs, with it having earned its rest. Nice introduction to those who have not experienced Linux before. I myself am a Linux support, open-source has better quality. Also, your site design is really nice and simple. Overall, nice. You weren’t exactly clear as to the damage of your dart, I now understand that the problem is the ribbon to the screen. If you are at all a hardware competent, you can just replace it with your own diy ribbon , there are diy articles about regarding: that sort of thing. Is this remotely within your skillset ? It is, and I may go that route down the road, but I have other things vying for my attention lately that are more interesting than messing with that…. I was actually planning on replacing that laptop in a few months anyway, and I’ve gotten over three years of really hard, excellent use out of it, so it’s nothing I’m worked up over. It’s been way too long since I was a regular reader of your blog, I missed this post. Currently I am using TWO old laptops, both of them Gateways. One is an MX7340 with 1.5 GB RAM and a 60 GB hard drive, and it’s been running Crunchbang (which you may know if you follow my own blog). I’ve had zero issues with it, and right now it’s a mix of testing/Jessie. The other has become my main laptop. It is a Gateway M460, upgraded to 2 GB RAM from the original 0.5 GB. I replaced the Windows XP on it with various current distros, including Peppermint, Linux Mint, Bodhi, and now Ubuntu. Just like the other, this machine runs perfectly fine – in fact I think the battery on it is in much better shape than my older MX7340. So the lesson seems clear: If you have a laptop that last ran Windows XP, don’t think it’s bound for the scrap heap – add some RAM and put a Linux distribution on it – you don’t even need a “lightweight” distro! Most of them work fine with 2 GB of RAM. LXDE is best for older laptop. 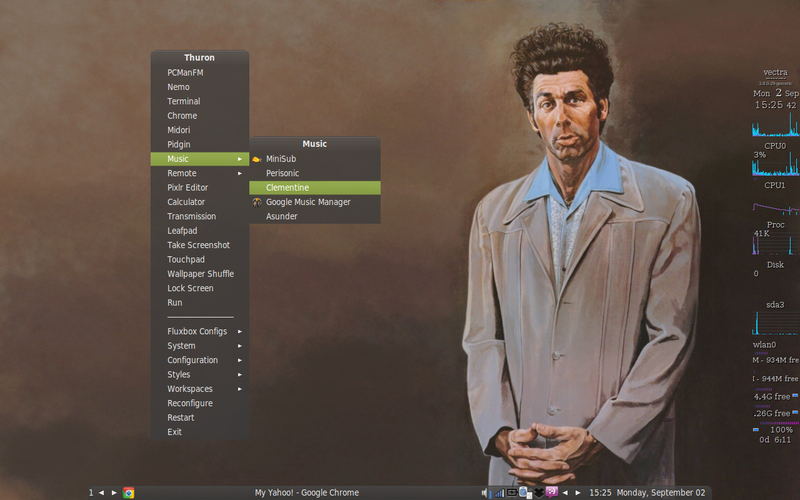 LXDE and Xfce both are good for old configuration Laptop. I have used it and find it works very good without lowering system performance. I moved on from Linux Mint to antiX because Fluxbox is well supported and antiX is designed to run on old machines like your laptop. Outstanding! Very Informative and looks as if my attempts to introduce my self to Linux with be far less painful than other Distributions that i have seen in the past. The added bonus was the Snap shot of the music library! Great choice of Tunes !! Cool! Glad you like it! The laptop I wrote about in this post I’m not using as a laptop anymore…. what I’ve done is slim it down even more. I’m running Fluxbox on it now, and Teamviewer in daemon mode, and I have it connected to a nice set of speakers in my family room. 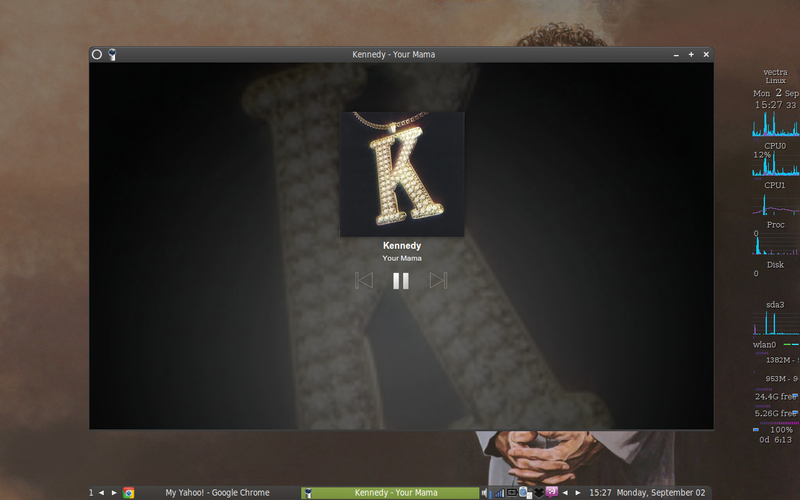 My wife and I connect to it via Teamviewer from our laptops and tablets and use it as a jukebox (utilizing Pandora, Subsonic, Google Music, etc.). This LMDE has been a life saver! If stress causes an early death this distro has saved me countless years. My Mother in-law has struggled since I took away her XP. With windows 7 and windows 8 /8.1 and the constant barrage of toast messages and auto updates it was a never ending game of Wack-A-Mole. She had to ask me about every single one and to explain them all over and over again. Not to mention unintentional installation of garbage, scams and malware. (Malware-Bytes and i are CLOSE friends) Things i don’t even notice because of how I tend to my personal machines. Finally after a little experimenting and some very interesting conversations with Trent I decided to just throw Mint on her machine (with no warning of course) and hope for the best. Well I did not ask for permission and to my surprise I did not have to as for forgiveness. She loves it. In fact i quote her saying “WOW this is way faster then it used to be”. She is 65 years old. That being said Linux is not always for the power users. As an added benefit, she has noticed the similarities between Mint and the Android OS on her Phone. At 65 she has moved beyond just barley making and taking calls to Texting, banking, iHeart radio, Games and other apps. So i say this in appreciation. Trent, I owe you a steak Dinner! In all seriousness, I’m always happy to hear someone else’s success story with a platform that I love to use. Glad I could help narrow the search a little bit. I’m biased, I know, but I find LMDE and regular Linux Mint so much more intuitive and simple than any version of Windows. To me, that makes it very suitable for non-technical users who just want to get their stuff done with a minimum of pain and fuss. Make me wanna do something with my sister’s laptop. It is an old one, maybe even weaker than your Toshiba. Currently it’s running windows 7 side by side with Linux Mint LXDE and I got to say it is…….very………….sllllllllooooowwwwwwwwww! I like the visual look of Peppermint. Thanks for this interesting post.